Pilgrim Seeker Heretic | Affirming the sacredness of life and the sacrament of relationships. Affirming the sacredness of life and the sacrament of relationships. It’s Holy Week and I’m Bummed! Wow! What is it? I have been tired, irritable, sorrowful, and confused for a few days–just bummed, plain and simple. I asked the question, and I may have gotten the answer. It’s Holy Week, and almost 2000 years since Christ’s crucifixion. It’s as if nothing has changed. Now, that’s a bummer! A sick and desperate young man. The central messages of Christ’s ministry were love God and love your neighbor as yourself. (Matthew 22: 36-40) He demonstrated this love through acts of mercy, compassion, and truth in love. His acts were inclusive of all people—no exceptions for race, culture, religion, economic status, or sexual identity/expression. He ate with sinners, ministered to lepers, sought justice for the poor and oppressed, welcomed the stranger in the land, invited women to share in his ministry, healed the sick and lame, and confronted the “religious” (the Pharisees) on their hypocrisy. For more on the woes of the Pharisees and Christ’s condemnations check out Luke 11: 37-52 or Matthew 23: 13-29. A Honduran family fleeing violence and seeking asylum in the US. This is the week Christ suffered and died because of the sins of the people—sins of exclusivity, greed, and idol worship—idols of money, power, position, and authority. For their sins of failure to act justly, love mercy, and walk humbly with their God. (Micah 6:8) I look around and am sorrowful as we continue to crucify the Christ daily. Our natural beauty and resources spoiled by pollution-our carelessness. We crucify the Christ when we refuse a 26-year old man life-saving medical services because he has no insurance and cannot afford to pay. We crucify the Christ when we refuse care and service to our LGBTQ community, and we do it in the name of religion—“sincerely held religious beliefs.” We crucify the Christ as we attempt to codify into law our exclusivity. We crucify the Christ when we refuse the stranger at our borders and compound his struggle and suffering. We crucify the Christ when we burden the poor with additional taxes while the coffers of the rich are brimming to overfull. We crucify the Christ when we allow the beauty and glory of his creation to be spoiled and polluted.There’s more, but enough said! Surely we get the picture! A sales tax burden on the poor. I am bummed, and I strive to hold on to hope—the hope of the resurrection. It is my prayer that as we celebrate resurrection that the true spirit of Christ be resurrected in each of us. That Christ’s spirit might emanate through us in all sorts of ways with acts of love, care and compassion, truth, and justice. Thanks be to God! Paying Attention in the Spirit of Mary Oliver! Whether walking in the woods, on the shore, or over the rocks, I try to pay attention. I am always astonished! Posted in A Pilgrim, Culture, Ecology, Faith, Nature, Photos, Poetry, Seeker, Spirituality, Travel, Uncategorized. In her recent Baptist News Global piece, Hidden pencils, urgent warnings and instructions Mary Oliver left the Church, Carol Davis Younger offered a lovely tribute to poet, Mary Oliver, and an insightful exhortation to the church to approach “Scripture – and our world – with the holy curiosity and expectancy Oliver did when she went to the woods and to the shore.” As Younger shared her experience with Upstream, I caught my breath and embraced the mutuality of our stories, our experiences, and perhaps our feelings – Mary Oliver’s, Younger’s, and mine. I too became better acquainted with Mary Oliver through her collected essays in Upstream. I was drawn to the book, so much so that I paid full, independent bookstore price for it. Something I rarely ever do! I had admired Mary Oliver as a poet and was curious as to her prose. Being a woods wanderer and stream jumper, the title Upstream, and its connotation of going against the flow, which I often do, piqued my interest. The cover photo looked like a place I would enjoy. I fully understand Younger’s response to the essay, “Power and Time.” As I read the essay, I felt that I was personally being both affirmed and admonished. I am keenly aware that my creative self needs solitude, a place apart, without interruptions. Oliver buoyed my spirit with her affirmation of this then promptly admonished me for being my own primary interrupter. For me it says that I need to attend this civic meeting, that I should give my wife more time and attention, that I must do my share of home maintenance. Returning to the creative work often finds that the spark of an idea has dimmed and the flow of words has dried up. In the creative work we can be, and probably are, our worst impediment. Oliver tells me that the “machinery of creativity” can’t be controlled or regulated. I believe it! More times than I want to recount I have awakened in the wee hours of the morning with an idea or a string of narrative going through my head. Over time, I have learned it is best that I go ahead, drag myself out of bed, and write it down for I will not be able to sleep if I don’t. I most assuredly will join Anderson as a “candidate for future regret” as I see a bouquet of withered buds of exciting ideas and plans that failed to blossom because I did not nurture them with power and time. I suppose my task going forward is to recognize the tiny buds of creative thoughts and ideas and give them their needed power and time. I suspect it will be an erratic path even in all my efforts to “keep my eyes on eternity,” reject the responsibilities that have claimed me, and discard the “many heavy coats” that burden. May I stay forever in the stream. May I pay attention and find my devotion. Even as I marvel at its intricate complexities. May I be humbled by its majesty. May I revere the fruit of the earth-the grass, the flower, the tree. May I respect the creature — the minuscule and the mighty. May I glorify the Creator of it all and be grateful. May I hear the silence that calls to me. May I feel the rippling waters. Whether with voice or pen in hand, may I tell about it all. I slept in and probably got the best sleep I have had in weeks. I greeted, kissed, held my wife, and told her “I love you!” (which I truly do). I had my coffee and cereal for breakfast, then caught a bit of “This Week” on TV, nothing new just a bummed and bleak outlook of politics as usual. We watched a beautiful cardinal in our back yard. Of course I took a picture! I then listened to the music portion of the worship service at our local mega-church. Good, yet I felt a bit of disconnect with cameras zooming in on the abundance of technology and aura of performance. Since my return to Turn This World Around a few weeks ago, I created an Amy Grant station on Pandora. Well that might be some worshipful listening! I tuned in and skipped around listening to parts of a couple of good songs, once among my favorites, “I Can Only Imagine,” and “Shout to the Lord.” Actually, I skipped so many songs that the program would not allow any more skips and forced me to listen. I turned it off! Too many words and too much busy noise. Suddenly I had this thought, like an epiphany. Beyond words! It is as if, for me, words are no longer a necessary nor perhaps meaningful mode of worship, my spirituality, or my connecting with God. Now, all of that seems to come with practicing Psalm 46:10 “Be still and know that I am God.” which is not so much about being quiet and motionless as it is about letting go, releasing control, and acknowledging vulnerabilities in order that we may know God and His power in our lives and the universe. For me it is about worshiping and knowing God with and through a heart of faith. Don’t get me wrong! I am not saying that words are nonessentials in our spiritual lives. After all, what am I doing now—writing, sharing my thoughts with words. We use words to share our stories, to connect with one another, to foster meaning and understanding with all sorts of folks in our daily lives. Maybe somewhat like the parables of Jesus. Perhaps only as we go beyond words in our personal worship and spirituality can we use words efficiently and effectively in the enhancement of God’s Kingdom on earth. I am passionate in my belief that everyone’s life is sacred, and as we share our stories with one another we invite greater understanding and compassion – we become portals of grace one to another. Needless to say, I will continue to share my stories and invite you all to do the same. I tugged several of my old college literature anthologies from the bottom bookshelf yesterday. No, not to do any serious study, but to use as weight for a gluing project! A paper filled with my handwriting fell from one of the books. The writing was in verse form, so I thought perhaps an old poem I had written and tucked away. I have a tendency to do that – start a writing project and put it away not to be found until years later, if at all. But this was not my “writing.” It was the lyrics to an old Amy Grant song, “Turn This World Around.” Apparently the song had some special meaning for me in 1997 since I had taken the time and effort to record the lyrics. The song was included in her Behind The Eyes album released in September 1997 and written by Amy Grant, Beverly Darnall, and Keith Thomas. We all know our world needs to turn around. We are headed in the wrong direction. Look no further than the death and destruction resulting from the numerous and lengthy armed conflicts throughout the world. Grasp the magnitude of gun violence, the global refugee crisis, increased human trafficking, and world hunger levels rising. We are the world! Only we, working individually and corporately with one another throughout our communities, cities, states, provinces, districts and countries, can turn this world around. Maybe one day we will turn and see behind the eyes of all our brothers and sisters regardless of race, religion, culture, nationality, sexual orientation or gender identity and see our sameness, reach out to one another, and experience the will and kingdom of God “on earth as it is in heaven.” Yes, maybe one day – maybe in this New Year! As we observe the Winter Solstice take a minute marvel at the glorious Fall we have enjoyed. Posted in A Pilgrim, Community, Ecology, Miracles, Nature, Photos, Poetry, Seeker, Spirituality, Uncategorized. 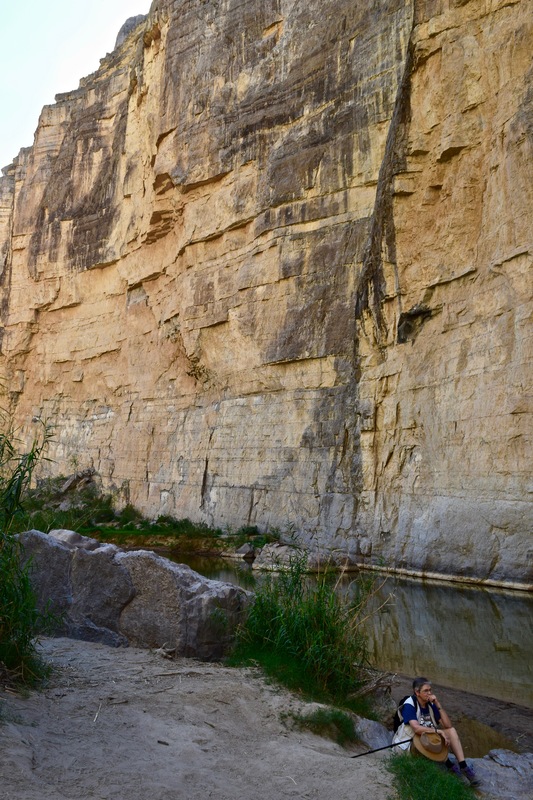 The gap where the Rio Grande exits the Santa Elena Canyon. 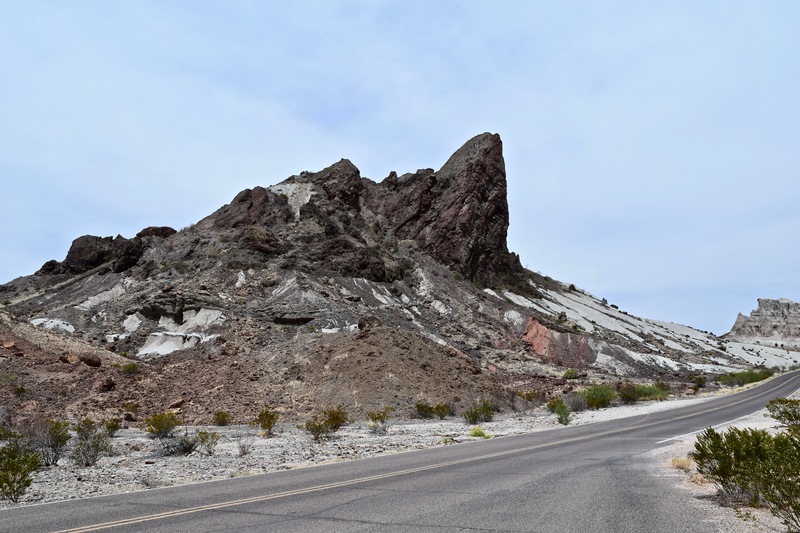 I am finally making public some of my photos from our April 2018 Big Bend Trip. Click on the first photo in each group and you can scroll through the photos in the light box. 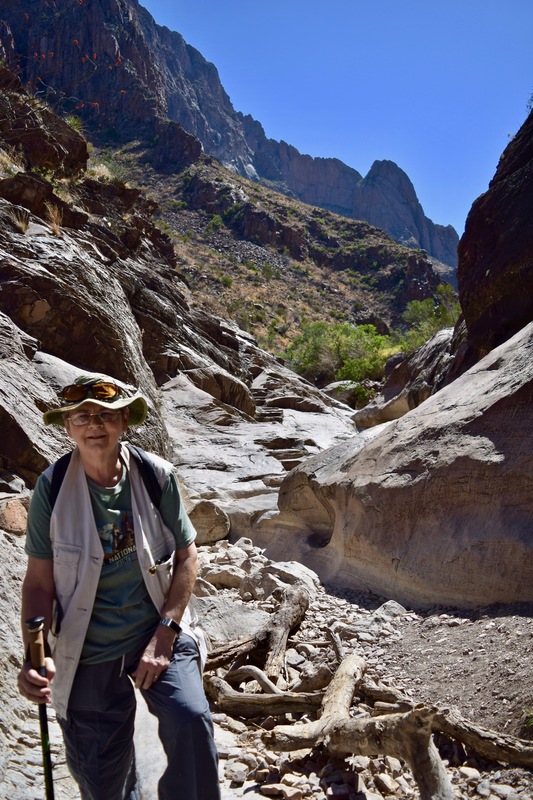 Unfortunately, I did not upload them all at once, so you will have to view them in groups: BOQUILLAS, THE WINDOW TRAIL, SANTA ELANA CANYON, CASA GRANDE. I hope there is no wall built along the Rio Grande River. That is not a political statement, but an ecological statement. The land is awesome. The ecosystems both magnificent and fragile. The views are breathtaking. I can not imagine a wall on this sacred land. Take a look and enjoy!! BOQUILLAS: Boquillas Port of Entry is the only official Rio Grande River crossing along the 118 miles of river border in Big Bend National Park. 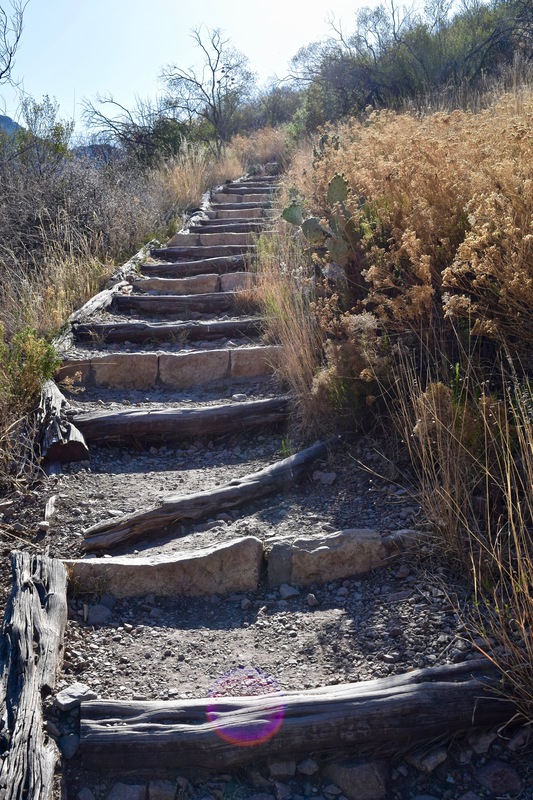 Going up the Boquillas Canyon Trail with minimal pain two days after the knee injury. The Spiny Fruited Prickly Pear cactus along the trail is a reminder to pay attention and stay on the trail. 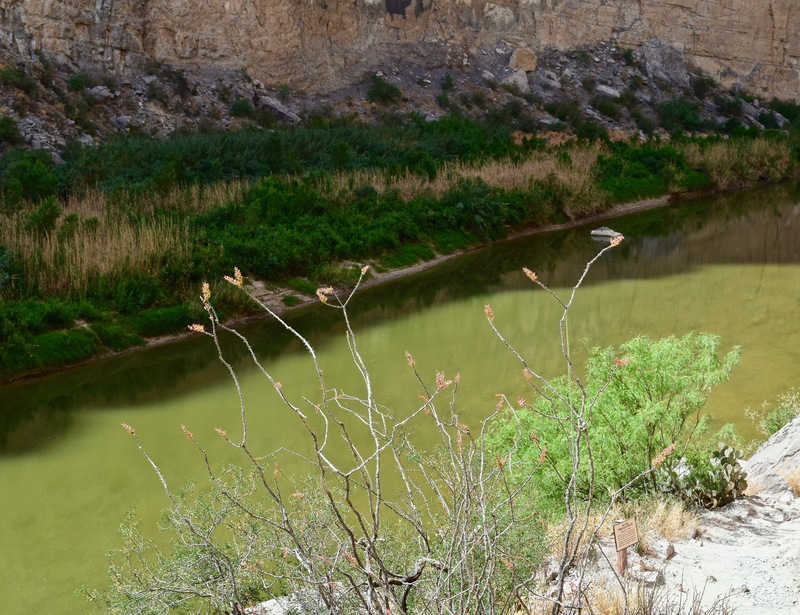 The Rio Grande winds its way to Boquillas Canyon. 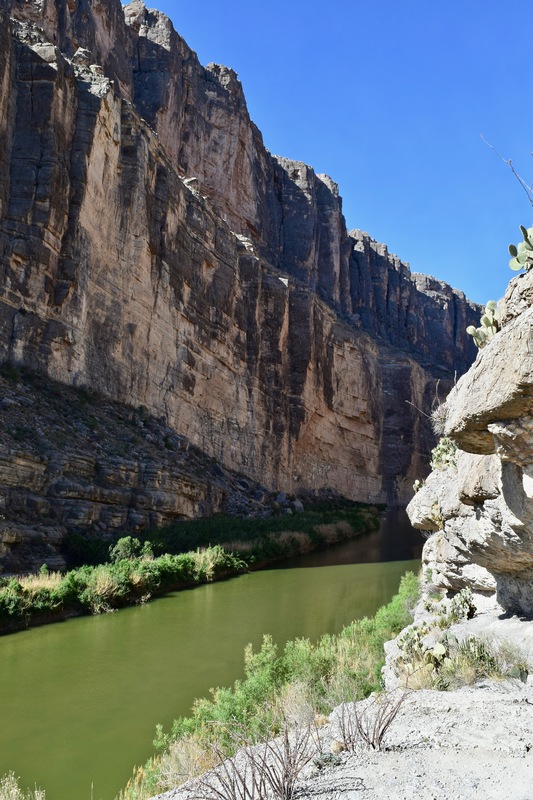 Hickers dwarfed by the massive wall of the Sierra del Carmen on the Texas side of the river. Boats on the Mexico side of the river. It is reported that at times Mexican musicians use the boats to float up and down the river playing for the hikers. Sometimes they will toss sealed mason jars in the water hoping to retrieve them later filled with money from the hikers. 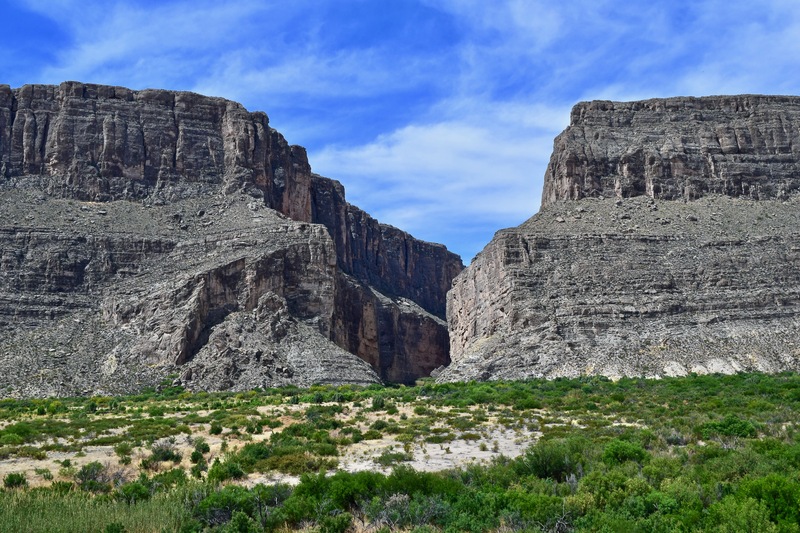 The limestone and shale canyon wall near the near the entry of Boquillas Canyon–the longest and deepest canyon in Big Bend. 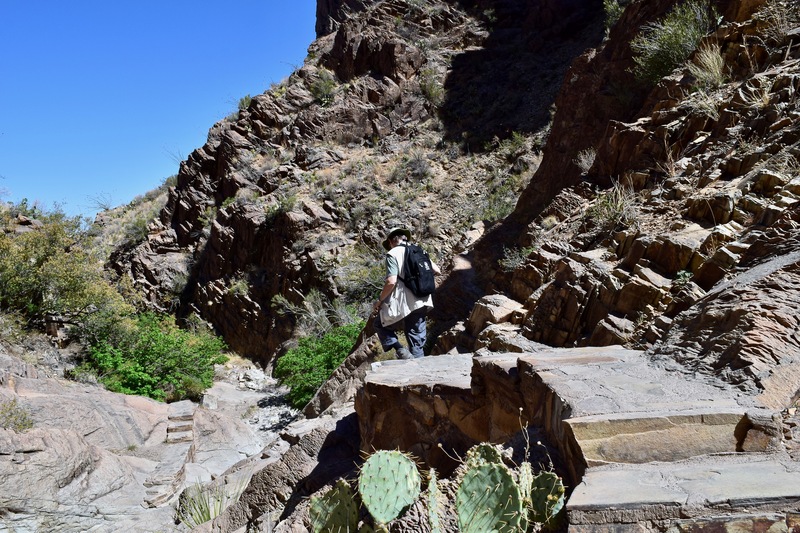 Hiker heading back up the Boquillas Canyon Trail as others start the descent. THE WINDOW TRAIL: The Window Trail just before it descends again and becomes very rocky. One of many rest stops on the hike out. 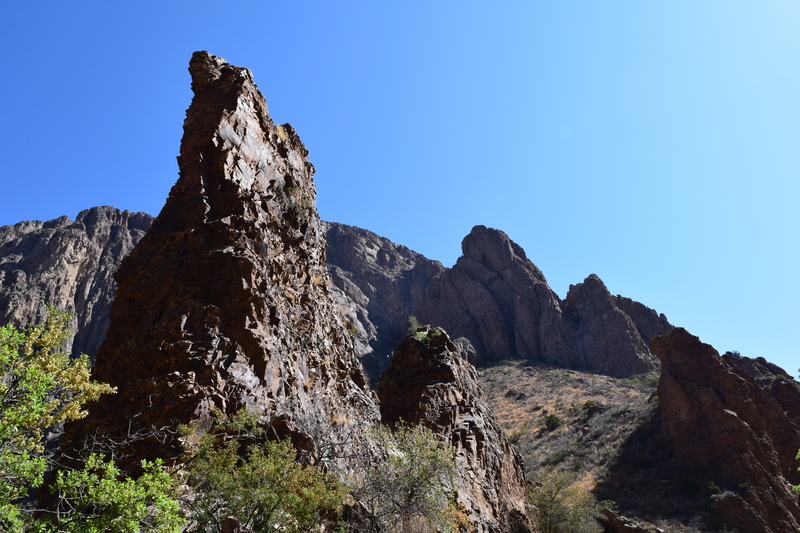 Rock spires along the trail. A flatter portion of the trail-the Window is the crevice to the right of the peak in the distant center. Limping up and down the steep rock steps. Just a small portion of the climb on the return hike. Hikers enjoying the view and the shade at the Window. Brenda and Lou Anne with the desert below through the Window. The lower rocky portion of the Window Trail. 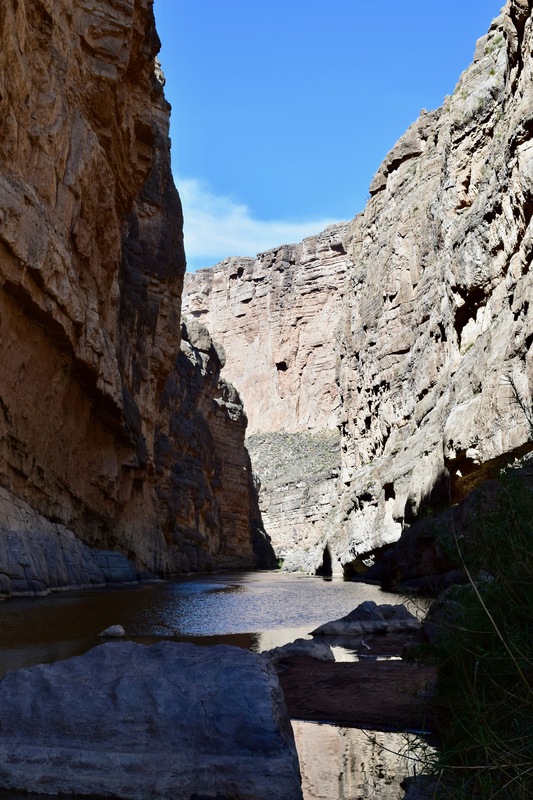 SANTA ELANA CANYON: The Rio Grande making its abrupt turn into the Santa Elena Canyon. 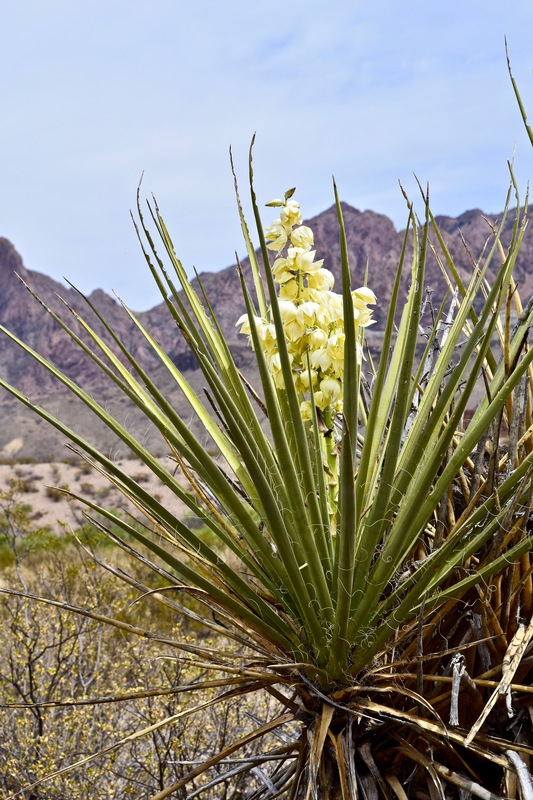 Torrey Yucca with the Chisos in the background. 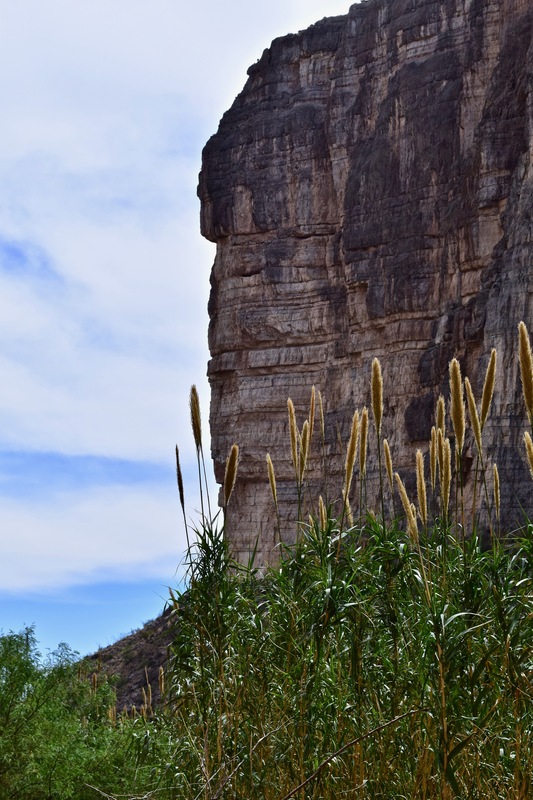 The lower Santa Elena Canyon Trail plants, mountains, and sky offer an impressive array of colors and textures. 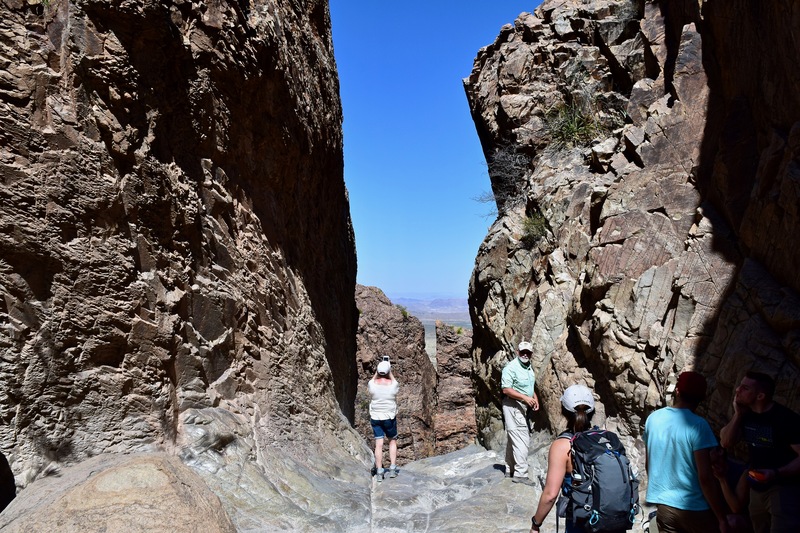 Solititude at the end of the Santa Elena Canyon Trail. 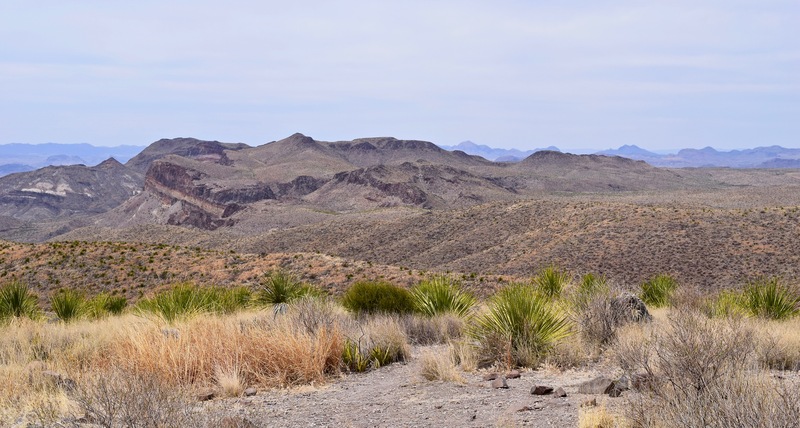 A view of the diverse ecology found in Big Bend National Park–the desert, fertile river valley, and mountains. 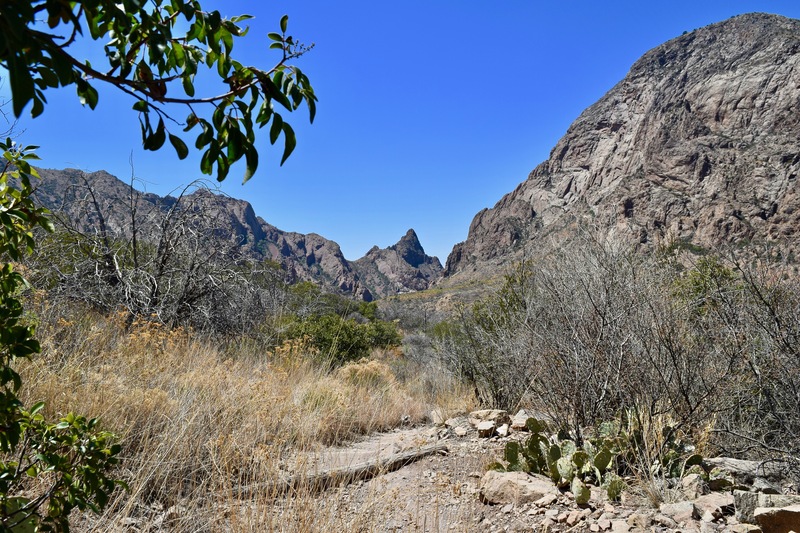 The Chisos range from Ross Maxwell Scenic Drive. 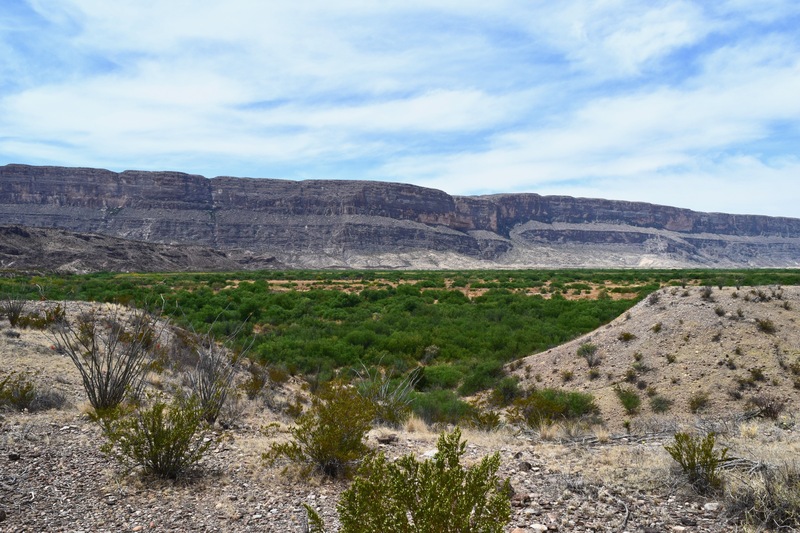 The Rio Grande from the rocky cliffs of the Texas Mesa del Auguila. 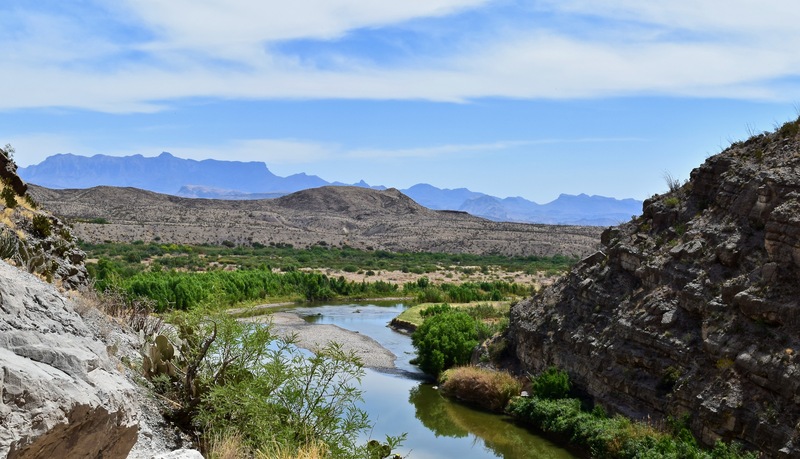 A view of the Mexican Sierra Ponce as the river enters the Santa Elena Canyon. 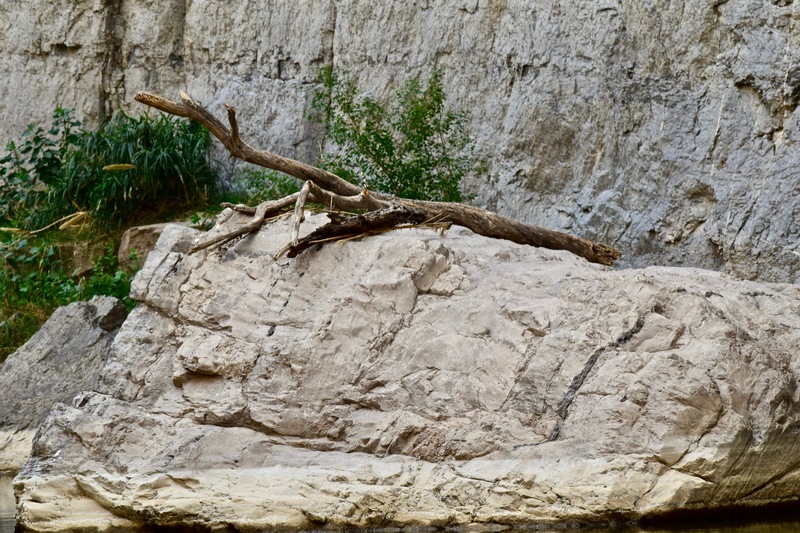 A stranded log on the banks of the Rio Grande as evidence of periods of higher water. 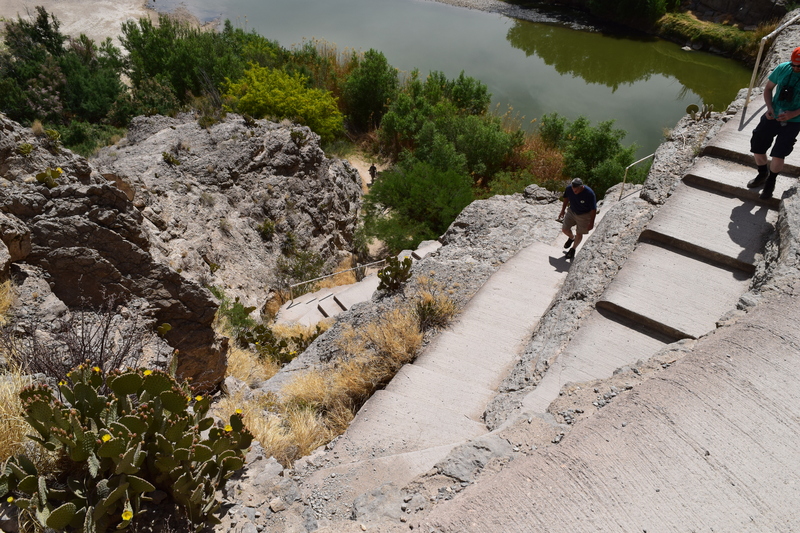 Hikers entering and exiting the Santa Elena Canyon Trail. Luckily the ascent is at the beginning. 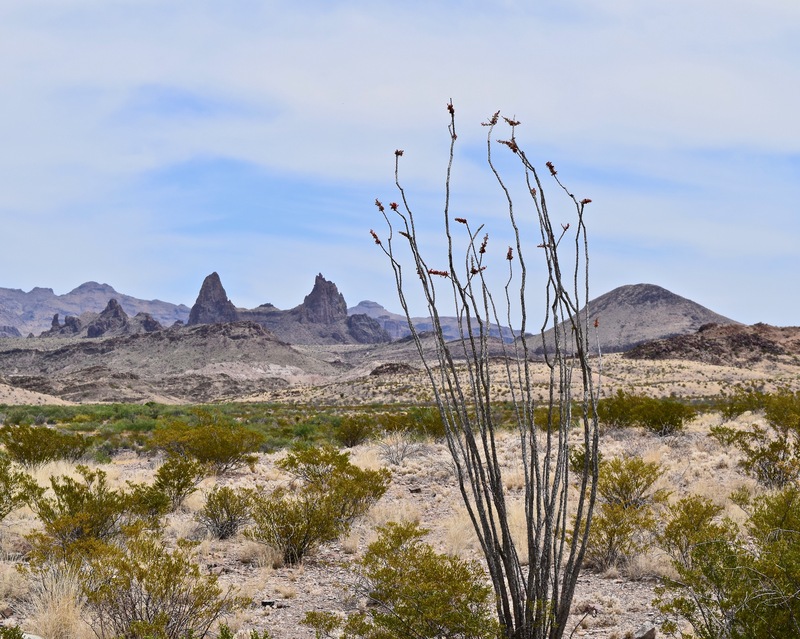 The Mule Ears formation and the abundant ocotillo plant on the Ross Maxwell Scenic Drive. 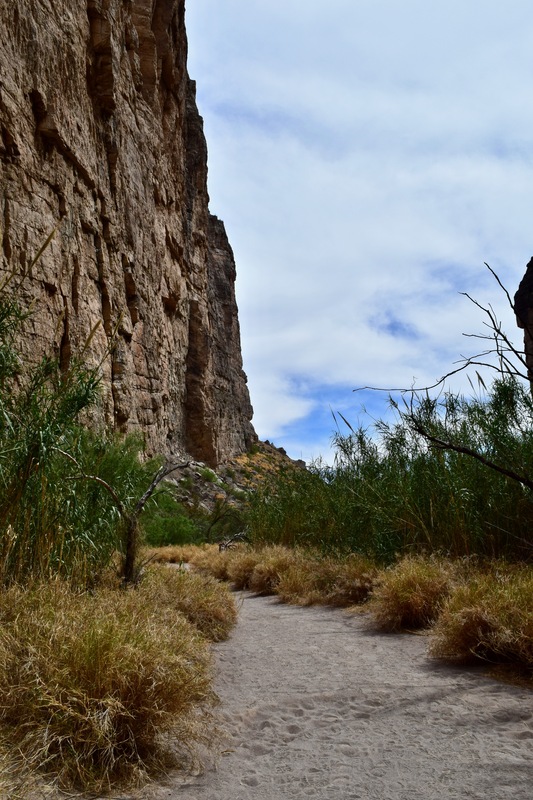 Hard stalwart canyon walls provide the backdrop for the willowy, flowing reed plants. Remnants of light volcanic ash and black basalt in the Tuff Canyon area. The view and some of the many sotol plants at Sotol Vista. 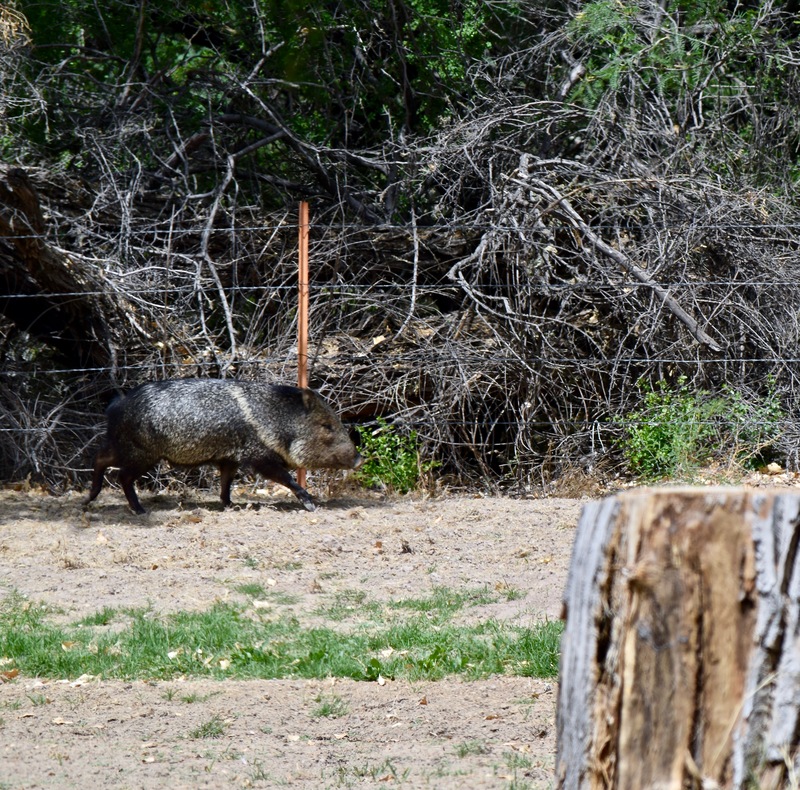 Not a pig, but a javelina at Cottonwood Campground near Castolon. 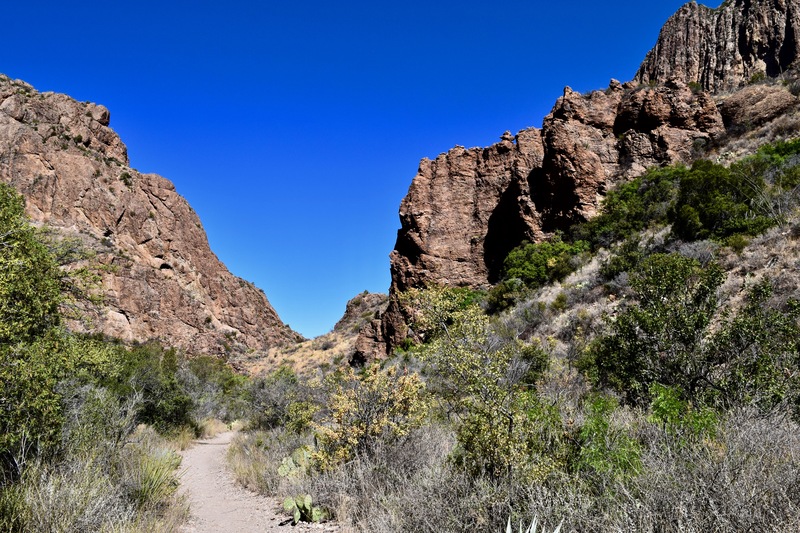 Casa Grande rises to 7,325 feet with bare rock towering cliffs hovering 2000 feet above the ranger station at Chisos Basin. 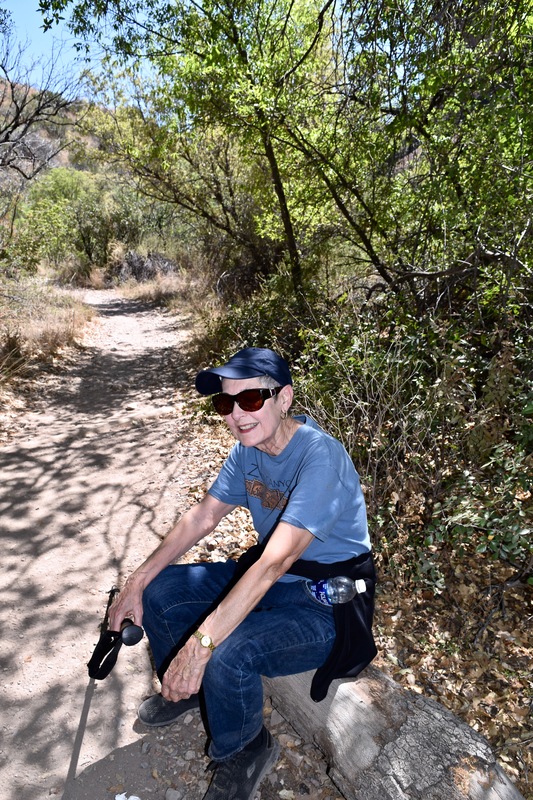 Brenda ready to tackle the 1.9 mile Basin Loop. 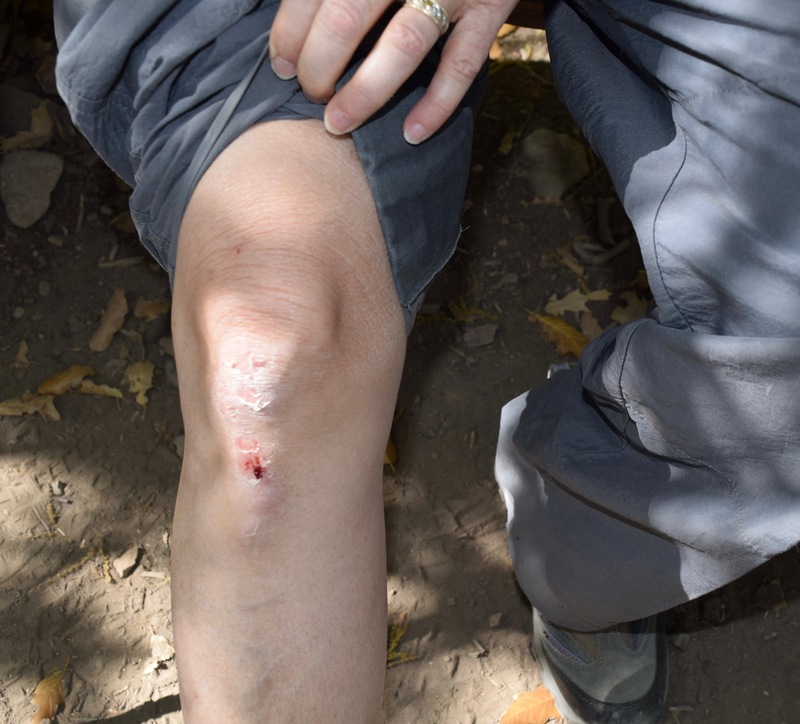 After the fall and knee injury all the other mountain trails are off limits. 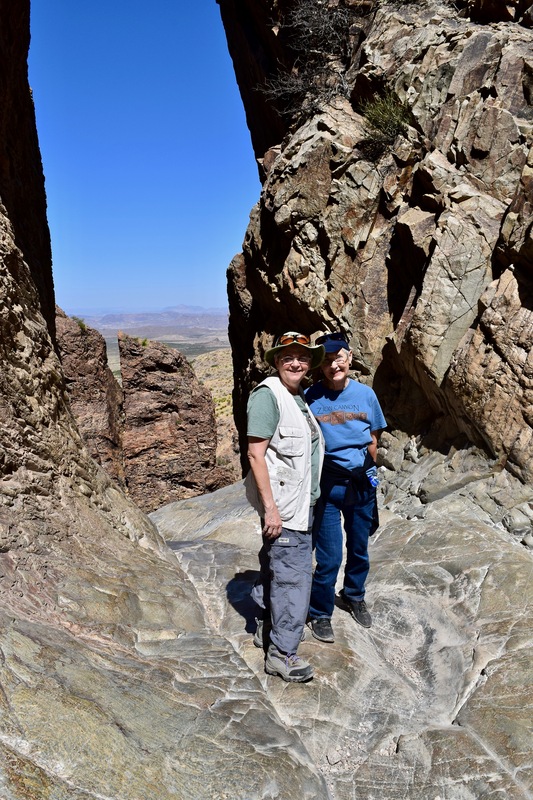 Lou Anne on the Chisos Basin Loop Trail with the Window in the background. An Alligator Juniper along the Basin Loop Trail. The rectangular scaly bark of the Alligator Juniper is a marvel. The Basin Trail is narrow at times but the Pinon Pine, various oaks, and juniper trees offer a good bit of shade in the upper portion. Looking south across the basin and the rim toward Emory Peak. Ran across this fellow, a Southwestern Fence Lizard, I think. Lou Anne nearing the end of the Loop Trail with a view of The Window. The Peregrine Falcon statue outside the Chisos Basin Visitor Center. Portions of the trails are closed March through May to protect them during their nesting season. Dugout Wells is an oasis of green, colorful flowers, and many birds in the midst of the Chihuahuan Desert. DUGOUT WELLS Desert Nature Trail with Nugent Mountain in the background. Imagine what this Blind Prickly Pear will look like when all the blooms are open! The Strawberry Pitaya plant in bloom. Sunset on the Sierra del Carmen at Rio Grande Village. It was a gray day with intermittent light and heavy showers. We needed the rain and I found myself humming, perhaps about the rain, perhaps about the call. I was again waiting for a call. My now eleven-year old great niece was diagnosed with Diffuse Intrinsic Pontine Glioma (DIPG), a rare and devastating brain tumor, almost three months ago. She tolerated the six-weeks of focused radiation treatments very well and with occasional medication has been fairly symptom free. The doctors say she is doing better than any child they have ever treated with DIPG. We are thankful! Last Friday she had an MRI to see if the radiation had had any effects on the tumor and as a prerequisite to possible participation in an immunotherapy clinical trial at Texas Children’s Hospital in Houston. From the initial diagnosis we have been keenly aware of the devastating statistical prognosis for DIPG patients. While there has been no denying the science of the disease, we have steadfastly prayed along with possibly thousands of others in our social media and home communities for God’s grace and healing for our girl. Family, friends, community members, total strangers have reached out with love, concern, compassion, and generosity. From the Make-A-Wish Foundation who sponsored a trip so that our girl could get her wish to “swim with the dolphins” to the local community sponsoring an event to raise funds for medical expenses and contributions to DIPG research there has been an outpouring of support that has confirmed our belief in God’s work of grace and goodness through good people. We’ve prayed for a miracle of healing while we’ve experienced the miracle of God’s love and grace everyday since the diagnosis. The call came from my sister. “Are you ready for this?” she asked. “What! It’s gone! We prayed for a miracle. Praise the Lord!” She was waiting to hear more from my niece so we quickly hung up amid tears of joy. These last months as I have prayed for healing, grace, wisdom, comfort, and strength for our girl and her family, I have been continually reminded of and prayed John 11:4, a verse I claimed for myself during some difficult days many years ago. This illness does not lead to death. It is for the glory of God so that the Son of God may be glorified through it. Yes, to God be the glory! While trying to soak in the reality of our answered prayer and this miracle, I found myself somewhat incredulous. Before the diagnosis I had prayed for the best even as I prepared for the worst, which is exactly what we got. Perhaps this time we have repeated that scenario, but with a different, positive result. Now that our prayer for the tumor to be gone is the reality, why does it seem incredible? Is it some flaw in our faith? Do we lack the capacity to fully believe in God’s power and grace? Are we so steeped in the modern science of medicine that we dismiss the Great Physician? Is incredulity inherent in miracles? I am reminded of the words of the tearful father with the epileptic son in Mark 9:24. Lord, I believe; Help my unbelief! I have read the MRI report stating, “There are no focal areas of abnormal signal, restricted diffusion, or abnormal enhancement within the brain. No mass, hemorrhage or acute infarct is present.” I have seen the before and after MRI images confirming no presence of a tumor. The doctors in Austin, Houston, and Boston have described the report findings as “rare, very rare.” One stated she has never seen this type of results following radiation treatment for DIPG. Doctors have conferred and are confident they did not misdiagnose. The consensus is that the original diagnosis of DIPG was correct, and there is no disputing that the once large, entangled, inoperable tumor is now gone. Lord, I do believe; help my unbelief. The images on the left are pre-radiation. Those on the right are post-radiation. This is not the end of our girl’s medical treatment. As scientists, the doctors are encouraging continued immunotherapy treatments in clinical trials to combat any possible remaining cancer cells. Only time and periodic MRI’s will tell if the tumor returns. Regardless of what the future may hold, in the here and now, we, and thousands of others, are celebrating and giving God the glory for this miracle of grace and healing. We continue with prayers of thanksgiving and for sustained healing and good health for our girl. I sat in the Tyler ISD School Board meeting last night anticipating a vote and a decision that I would support–whatever the outcome–out of respect for the leadership and authority of the school board. I came away incredulous! The motion to change the name of Robert E. Lee High School and begin the new name selection process was followed by stony silence. The board president reminded the members that seconding a motion did not infer or require an affirmative vote. More silence from the dais and the crowd of approximately 100 citizens. The motion was allowed to die for lack of a second. What was going on? In the July board meeting, just two weeks previous, board members had expressed frustration with continued focus on the name change issue and rejected the ideas of more community input meetings or a subcommittee for further study. Instead, they urged an up or down vote on whether to change the name as a means to bring closure one way or another to the entire issue. I was not the only one bewildered after the board’s refusal to allow a vote in this special meeting called for that purpose. Though not the movie setting, “dazed and confused” would be an apt descriptor for many faces in the crowd. Approximately a year ago after the incident surrounding the controversy of a Robert E. Lee statue in Charlottesville, Virginia, a grassroots effort focused on changing the name of the south Tyler Robert E. Lee High School sprouted and grew. Equally as quickly a counter group took root, and Tyler, once again was a divided community. More accurately the racial tensions that have long remained lumps under Tyler’s beautiful public carpet of roses and azaleas were exposed. The carpet was ripped up and the dust flew! In September 2017 board members initially signaled support for a name change with one member asking, “Is it fair to make African-American students attend a school named for the leading figure of the Confederacy?” Another stated in reference to the name change, “This is not changing history, this is making a positive impact today,” and urged the board to “do the right thing. . . It’s time for a change.” So what happened? What changed in eleven months? Unfortunately as the year progressed, the public and, I can only assume, the private discourse was not always civil and respectful. Dueling Facebook groups logged on and petitions swirled. Honestly, when I saw some of the posts, my heart broke and I thought, Oh, no, no! Let’s not go there! Attendance at school board meetings skyrocketed. Items regarding the name change issue were on the official board agenda four times during the past year. Approximately 150 to 200 citizens made public comments at these and other board meetings with the numbers for and against the change fairly equal. Needless to say, it was at times ugly. What I found even more interesting and unsettling was that again, with only a few exceptions, the board members did not talk about what they believed would be the impact of a name change or no name change on current or future students. Although they espoused their focus as a board was to work toward positive, successful student outcomes, I did not hear, “I believe changing the name would have a negative/positive impact on student achievement because. . .” I also did not hear, “I believe changing the name would have a positive/negative impact on our community because. . .” Logically, every issue before the board should be viewed through the lens of how will this impact student outcomes/achievement. How will it impact our community as a whole and thus our community of students? With few exceptions specific answers to these vital questions were not a large part of the board members’ discussion at this or any previous meeting to my knowledge. Maybe, to the detriment of all, some in the community allowed their emotions to guide their discourse, and in the end, perhaps the majority of the board members did as well. As school board members and leaders of the community, they failed to lead. They failed to remain objectively focused on the issue—a school name change—and how that change would or would not impact student outcomes, now and in the future. Granted, it is a difficult, highly charged, emotional issue with prospects for a general consensus being very bleak even in the process of extended civil discourse. Surely, the board members knew this. Also, I would hope they knew when they ran for office that there would be times of difficult decisions, contentious personalities, unhappy people, and they could possibly, most probably, at some point be the target of someone’s ill-temper. The community expected a vote. The board members had lead folks to believe that they wanted a vote, a decision. Why didn’t it happen? Why did our leaders fail to lead? I have my ideas, which are purely speculative and probably, for now, are best kept to myself. As I left the board meeting amidst the dazed and confused, I heard various descriptors–cowards, shameful, no moral courage, gutless. Well, I don’t know about all that. I do believe, in this instance they failed to rise above the fray, maintain their focus on the best possible student outcomes, measure the issue through that lens, and vote on a difficult issue. On this occasion, they failed to lead. One board member stated prior to the “vote, no vote” that no matter what the board had done up until this point this is how they’re going to be remembered. Unfortunately, I believe he is correct! I was glad to see the news that a vote on the school name change is on the agenda for the school board meeting on Monday, August 6. I realize this has been a very difficult and divisive issue for our community and to some extent the school board. I agree, it is time for the board to vote on the issue and for our community to commit to respectfully abide by the board’s decision. Unfortunately, this is one of those situations fraught with highly charged emotions and opinions with folks unlikely to come to any general consensus even in the process of an extended civil discourse and dialogue. It truly saddens me that our community’s discourse on this issue was not always civil or respectful. Thus, you seven, as members of the school board, are tasked with making a decision which will have a significant and lasting impact on our students, both current and future, and on our community as a whole. I respect your leadership and your courage as you do this, knowing that whatever decision you make, there will be those who will not be pleased. assure a school that the students could be proud of and want to attend, and ultimately have a positive effect on student achievement. This is our ultimate goal—student achievement. promote a positive, progressive image for our community, a community committed to the well being of all our students and excellence in their education. be an enticement for families and businesses considering moving into the Tyler area. I ask each of you to vote in favor of the name change. As leaders in our community, your making a unanimous vote would be a model of unity for our community and influential in promoting community healing and reconciliation. After a vote to change the name, it would be my hope that a diverse group of stakeholders—community members, school representatives, students, parents—would be tasked to come together and begin the process of new name selection and determining an appropriate means to remember and recognize the school’s history. . Perhaps this process can be the mechanism for community reconciliation—a coming together and discussing shared hopes and visions for our students, schools, and community. We have spent a year focusing on our disagreement, which never brings forth a solution. With your leadership, our community can turn its focus to the future and all the possibilities of this brand new thing. Thank you for your service and dedication to excellence in education for all our Tyler students. I want you to know that I will respectfully abide by whatever decision the board makes on this issue and encourage others to do so. During my 38 years in education and counseling I always told my students that it was okay, and sometimes even understandable, if they did not like the rules or decisions made by their parents or teachers, and they were expected to respect the authority represented by their parents and teachers by abiding by the rules and decisions. I see this situation as somewhat similar. You, as the board, are the current elected leaders of our district and vested with the authority to make rules and decisions for the district. I hope and pray that once your decision is made Monday evening that all the good folks of Tyler ISD will respectfully accept your decision, come together, and continue to work toward providing our students with the excellent educational opportunities they deserve. © Brenda K. McWilliams and PSHeretic, 2013. Unauthorized use and/or duplication of this material without express and written permission from this blog’s author and/or owner is strictly prohibited. Excerpts and links may be used, provided that full and clear credit is given to Brenda K. McWilliams and PSHeretic with appropriate and specific direction to the original content.